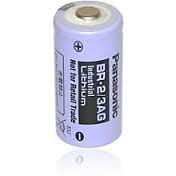 BR-2/3AG : 3.0 volt 1450mAh Panasonic Lithium Primary battery. 1.32" tall x 0.67" diameter. Non-rechargeable. Replaces the following battery #s: BR-2/3A, BR-2/3AG, BR-2/3AGE, BR-2/3AGN, BR17335, BR2/3A, BR2/3AG, BR2/3AGE, BR2/3AGN, CR-2/3A, CR2/3A.